Product #6053 | SKU APH-1 | 5.0 (based on 1 rating) Thanks for your rating! 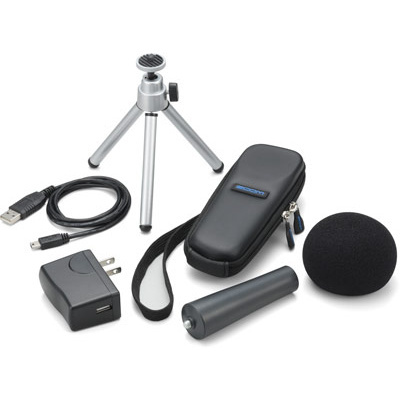 The H1 Accessory Kit includes a padded carrying case, a tabletop tripod stand, a foam windscreen, a detachable microphone handle, a USB cable, and an AC power adapter. It's a bit of a bummer that these items aren't included with the H1 itself, but there's definitely a huge amount of value added to your recording set up by grabbing this pack. I've found the mini tripod is particularly helpful for desktop mounting when recorder interviews and the case, wall adaptor and windshield are definitely helpful depending on your recording scenario. Loving it.